LNG bunkering is a practice of supplying the LNG fuel to a ship for its consumption. LNG is a cleaner fuel than conventional marine fuels, such as heavy fuel oil, marine diesel fuel, and marine gas fuels. Global concerns about air pollution, stricter regulations on chemical emissions as a result of fuel burning, and growth of the marine industry are expected to drive the demand for LNG vessel bunkering. On 27th October 2016, United Nation’s shipping agency announced a reduction in the limit on sulfur content in marine fuels from current 3.5% to 0.5%. The new limitation would come into force during 2020. Most of the refineries will require lengthy and expensive modifications to produce marine fuels that meet the sulfur content requisite according to new regulation. Some of the current refineries are expected to fall short of making such modifications by 2020, in turn causing fuel shortage. LNG fuel, on the other hand, has low sulfur content and needs comparatively less processing to meet the sulfur content limits, and hence, will require smaller and less expensive modifications compared to conventional marine fuels. Therefore, LNG is not only expected to help meet the fuel demands of the marine industry but also the economic viability of LNG is expected to increase in comparison to conventional marine fuels, due to low desulfurization processing cost of LNG. This development is expected to drive the LNG vessel bunkering market during the forecast period. LNG transportation is costlier than liquid fuel, as it is a cryogenic fuel. Due to LNG’s high flammability and cryogenic nature, if released into the atmosphere, it forms a flammable vapor cloud, which adds to the risk of transportation. Due to its hazardous nature and requirement of specific pressure-temperature conditions, the infrastructure required for LNG is costlier than conventional marine fuels. The high transportation cost and the safety majors required for transportation are expected to restrain the LNG bunkering market, particularly in developing countries. The marine industry is going through a downturn, due to reduced offshore oil and gas activity. During 2015-2016, offshore investment in the oil & gas industry dropped by 30%. The oil & gas industry spending on offshore support vessels (OSV) dropped from USD 18.1 billion to USD 11.1 billion during 2014-2016. The oil prices are expected to increase during the forecast period. The increasing oil prices are expected to drive the OSV demand from 2018 onward, but this demand is not expected to reach 2013 levels during the forecast period. Some of the negative impact is expected to be offset by increasing offshore activity in the renewable energy sector, like installation of wind farms. Slow growth of the offshore oil & gas industry is expected to restrain the offshore service vessels demand, in turn, constraining the LNG vessel bunkering market in oil & gas industry. The maritime industry of Europe and North America is expected to move toward cleaner LNG fuel faster than rest of the regions, and hence, are expected to continue to be the leaders in LNG bunkering market. The growth in developing countries, like China and India, is expected to drive the marine trade in Asia-Pacific region. But this region lacks the infrastructure required for LNG fuel transportation, which in turn is expected to hinder the growth of LNG vessel bunkering market during the forecast period. The United States is surrounded by North Atlantic Ocean, the biggest trade corridor on one side and North Pacific Ocean, fastest growing trade corridor, on the other side. 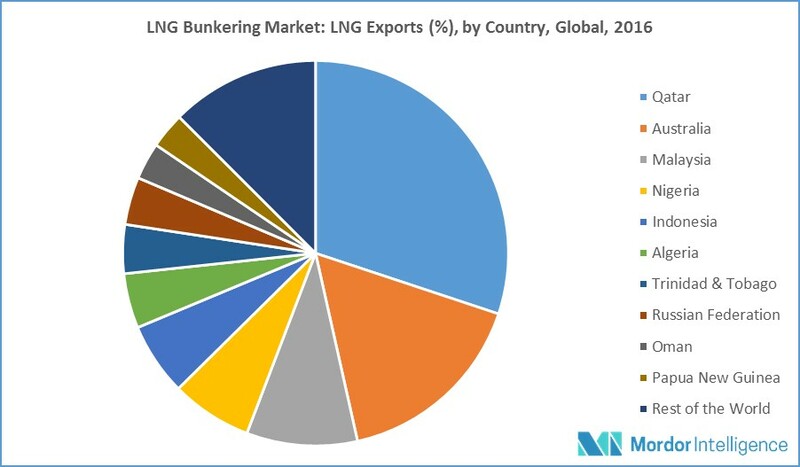 With large gas reserves and availability of infrastructure, the United States has a unique advantage to be the leader in LNG bunkering market. Dec 2017: The Maritime and Port Authority (MPA) of Singapore announced that it will invest another USD 12 million to boost LNG bunkering in Port of Singapore. Analysis of the effect of regulations in the marine industry on the LNG bunkering market. Identify which end-user industry is expected to dominate the market. Identify which regions are expected to witness the fastest growth during the forecast period and why.